Zaanse Schans (Dutch pronunciation: [ˈzaːnsə ˈsxɑns]) is a neighbourhood of Zaandam, near Zaandijk, Netherlands. It is best known for its collection of well-preserved historic windmills and houses. From 1961 to 1974 old buildings from all over the Zaanstreek were relocated using lowboy trailers to the area. The Zaans Museum, established in 1994 near the first Zaanse Schans windmill, is located south of the neighbourhood. Zaanse Schans derived its name from the river Zaan and its original function as sconce (schans in Dutch) against the Spanish troops during the Eighty Years' War of Dutch independence. It is one of the popular tourist attractions of the Netherlands and an anchor point of the European Route of Industrial Heritage (ERIH). The neighbourhood attracted approximately 1.6 million visitors in 2014. It is served by Zaandijk Zaanse Schans railway station, 18 minutes away from Amsterdam Centraal station. The Zaanse Schans houses seven museums — the Weavers House, the Cooperage, the Jisper House, Zaan Time Museum, Albert Heijn Museum Shop and the Bakery Museum. The whole neighbourhood is a popular tourist attraction and there is a debate in local politics on how to reduce overcrowding. The windmills were built after 1574. Names of the mills from left to right: Het Jonge Schaap ("The Young Sheep"), De Zoeker ("The Seeker"), De Kat ("The Cat"), De Gekroonde Poelenburg ("The Crowned Poelenburg") and De Huisman ("The Houseman"). ^ "History: Zaanse Schans brings Dutch history to life". Zaanse Schans. Retrieved 23 February 2015. 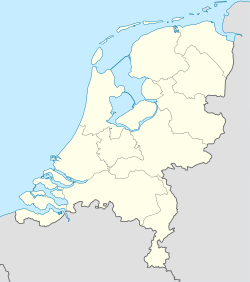 Wikimedia Commons has media related to Zaanse Schans. Wikivoyage has a travel guide for Zaanse Schans.